One of my favorite places to take photos of this Renaissance city, parted by the River Arno and rejoined by the many picturesque bridges, is the Piazza Michelangelo and then higher up the hillside, the Piazza San Miniato al Monte. 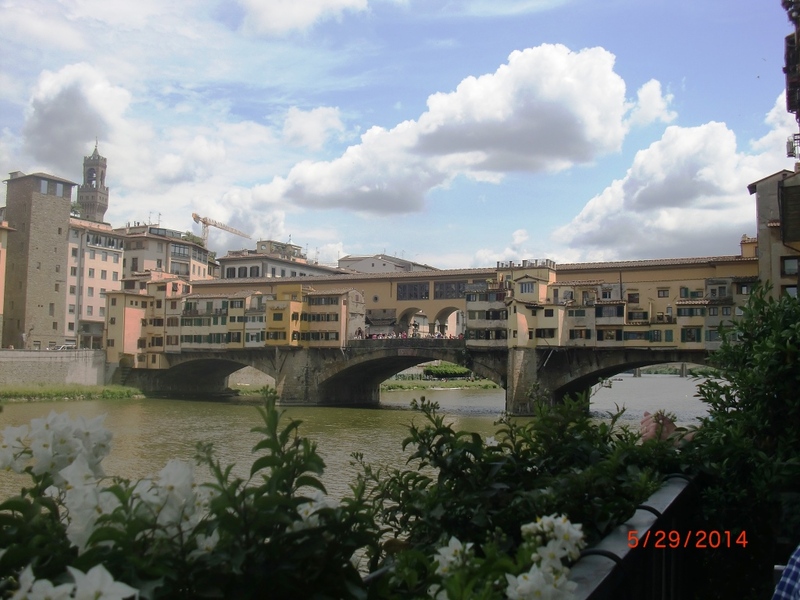 Both are walking distance from the Ponte Vecchio, although a bit of a hike. 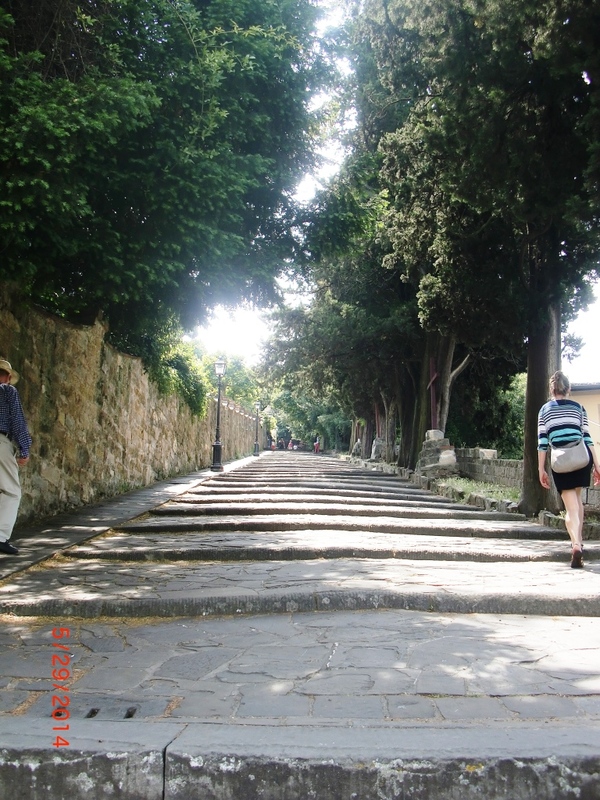 It was Ascension Day and a good day to climb the hill by way of the Stations of the Cross, a broad staircase still used on occasion for Lenten liturgies, with giant wooden crosses placed at intervals. I was perhaps the only one in sight that paused at each cross and repeated a prayer, making the sign of the cross and genuflecting, for I have been trying to increase my public witness bit by bit (grace at restaurants, etc.). At the tenth station, we arrived at the Piazza Michelangelo, where a broad viewing terrace welcomes tour buses, wedding photographers, and wide-eyed visitors snapping photos. 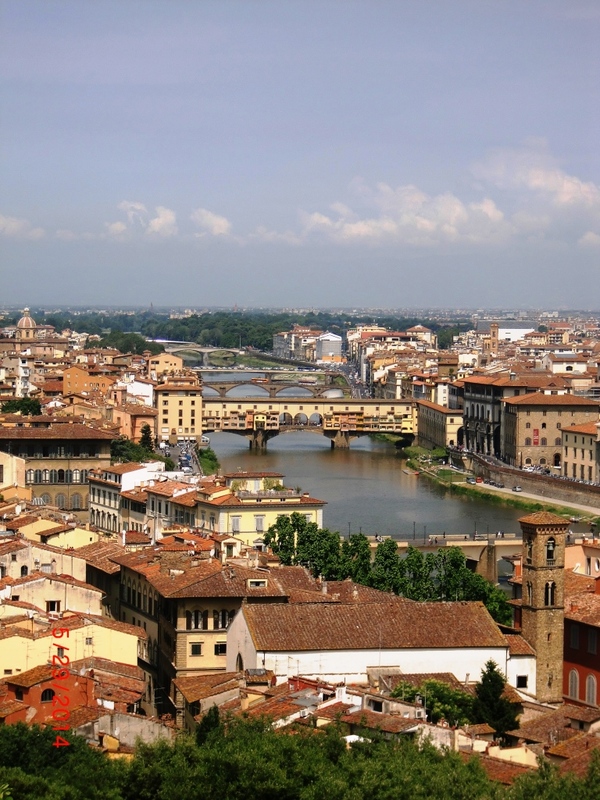 Florence spread before us, a 180 degree panorama. 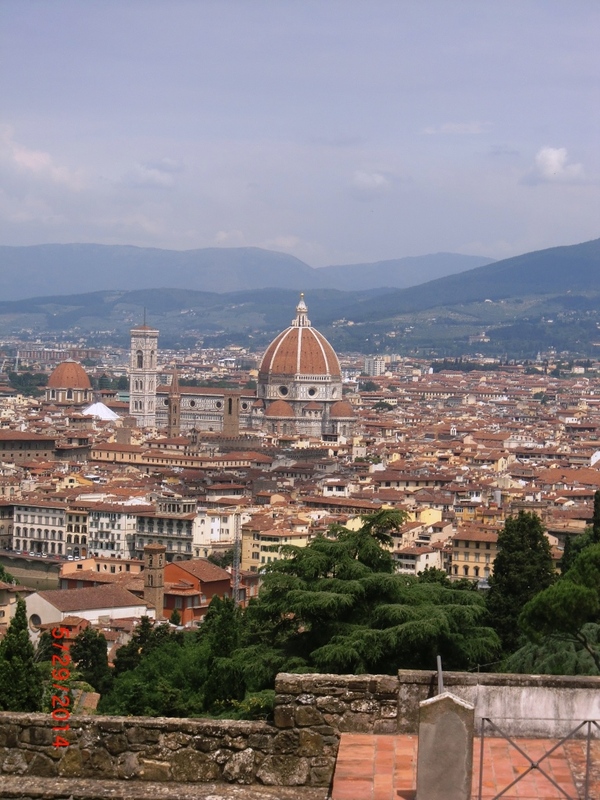 The domes rose from the red tile roofs, the city bordered by the green Tuscan hills of Mary’s May. The skies were blue for the moment, a celestial dome much more expansive than Brunelleschi’s, an opening between billowing clouds blown by the wind. We continued up the stairs, completing the stations, to San Miniato, a medieval-Romanesque basilica honoring an early Christian martyr. We have in the past heard Dominicans chanting the noon office in the crypt where the relics of the saint lie under the high altar, but today we heard only the sounds of school children and their guides, moving from one aisle to another, their faces rapt, looking up in wonder. It is a colorful church, with frescoes and mosaics and a haunting sense of the past, of the holy, of stepping into sacred space. 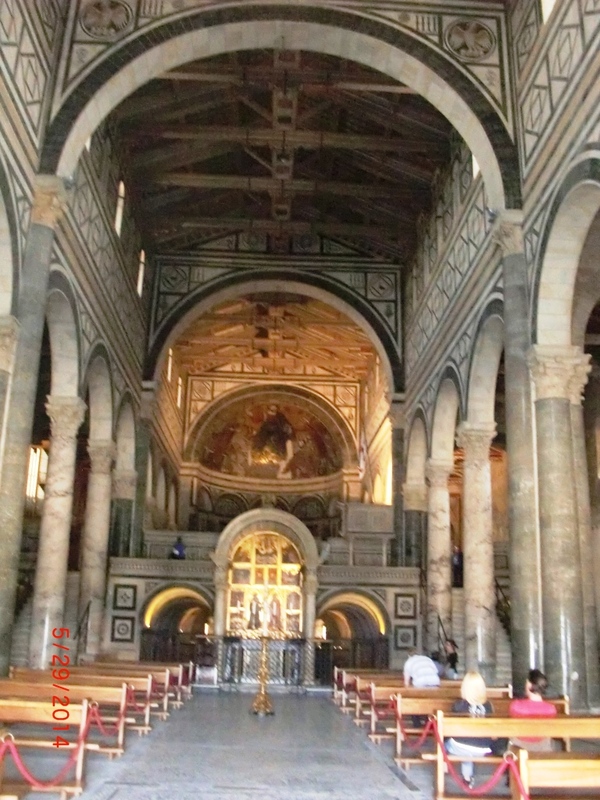 We rested in a pew in the nave and I thought of Madeleine and Jack in my novel Pilgrimage who visit San Miniato, where she experiences another step in her healing. The church calls one to simplify, to be quiet, to listen to the still small voice of God. It’s vastness and its beauty filter into the heart just as perfect harmonies capture the ear. And perhaps it is the balance, the proportions of such a place that delight the eye. Perhaps it is the sense of history. Perhaps it is the mysterious mystery of God reflected in both the movement of the arched and vaulted stone and the pastel figures peering from the walls, these saints telling the story of God and his great love walking among us. My own concerns seem small in such a place, as though outranked by the luminous, but also there is a sense that they have been absorbed by God through my prayers. All I need do is give them up, give up my everyday worries and little fears. All I need do is say yes to God. God gives us the means to be happy, he shows us how. We merely need to say yes, to listen, to obey, to repent. So I generally do that, again and again, repenting again and again, saying yes again and again, as I sit in a pew and gaze about me in such a holy place. Finally, emptied and full-filled, I leave through the bright doors onto the even brighter gravel terrace as though in a trance, changed. Florence lies before me, the same but different, more a background to life than life itself, not nearly as interesting and colorful as the mystery of the heartbeat of God, of his coming among us, dying, rising, and ascending to Heaven. We followed the stairs down the hill to the river and found a cafe for lunch. We said little, contented with the peace of San Miniato, not wanting to lose any of it, holding it close. Words returned slowly, and we took more photos of the river and the quaint old bridge. We shared a some Chianti and pasta. We sighed and were thankful. It was a good Ascension Day, full of resurrection and new life.